This delicious Asian inspired cabbage salad is so fresh and healthy! Cabbage, apples, green onions, romaine lettuce, carrots, slivered almonds and grilled chicken topped with the most delicious and healthy spicy Thai peanut dressing. It’s the easiest healthy recipe for make ahead, dinner, or lunch on the go! Football season is fast approaching (and if you love NFL preseason, well, you are already watching games!) Between being a graduate of the University of Nebraska and living in Denver, both college football and NFL are a big deal at Casa Pura Vida. The best part? Football season doesn’t really overlap with futból season (and we celebrated the World Cup big time this year with a Costa Rican vegetarian bean dip recipe and a super fun vegetarian queso fundido recipe) so we love to host and attend football watch parties. Everyone knows football parties are almost as much about the party as the game! I’ve recently started a big lifestyle change- I have joined the State of Slim program at our local research hospital and have started a 16 week Colorado Diet program. It’s long overdue- weight just kept creeping on and I kept finding reasons not to take care of my health. I’m so excited to be participating- and losing weight- but the new plan will last ALL of football season. Which means I had to create some delicious, sugar free, protein and veggie packed recipes that will feed a crowd AND taste good. 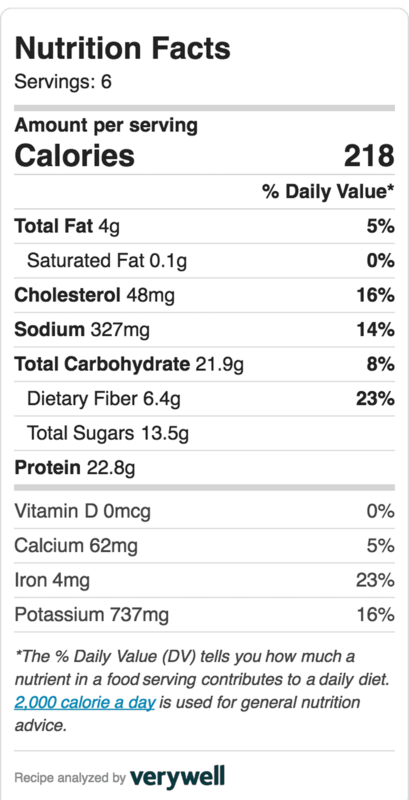 The best part about my diet? Any calorie free beverage is allowed, so I haven’t had to give up my beloved Coke® Zero Sugar. 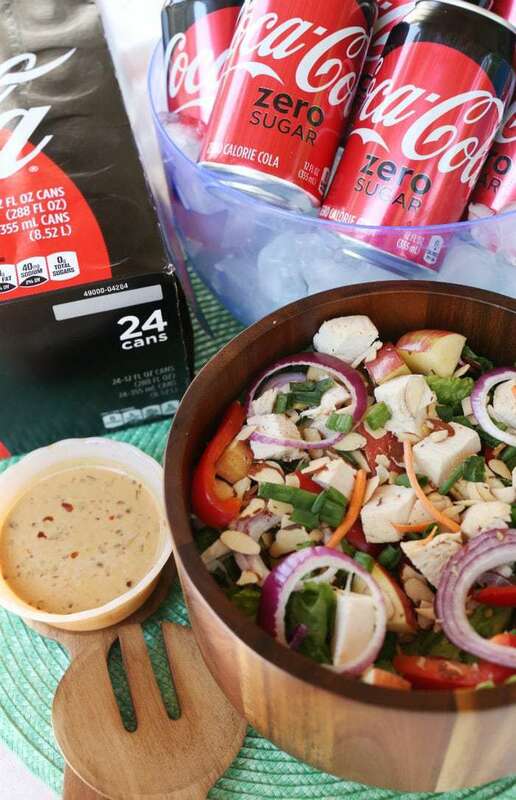 I’ve been looking for great recipe pairings to go with the soda- I love fizzy drinks and an ice cold Coke® Zero Sugar is something I look forward to each day. So when it comes time for the big game- whether it be college or pro football, I want to make sure that there are lots of options on the table when it comes to food. There’s almost always the requisite chips and salsa, veggie tray and fruit salad for the kids, but this season I wanted to focus on a delicious recipe that everyone would love and would be healthy. 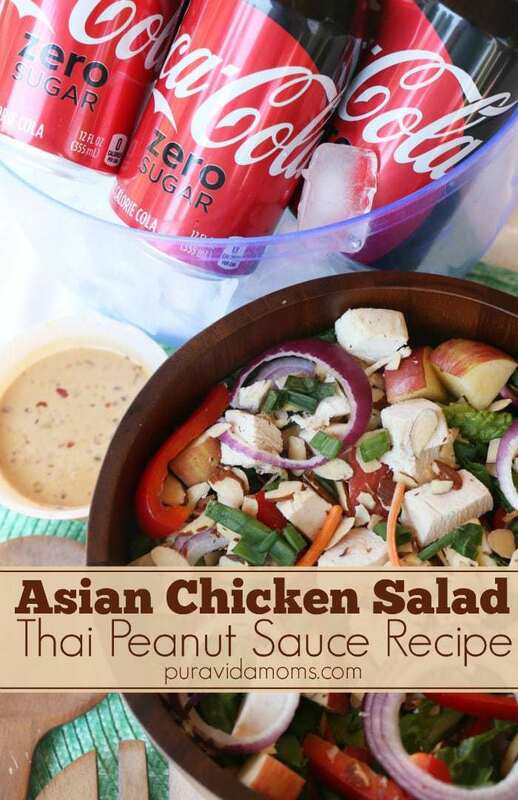 Plus, I absolutely adore Asian flavors alongside a cold can of Coke® Zero Sugar. And that’s where this spicy Thai peanut dressing was born. Layers upon layers of flavor, a good amount of protein to keep everyone satisfied during the whole game- and a perfect pairing with Coke® Zero Sugar. I often will make this healthy spicy Thai peanut dressing with grilled chicken and lightly cook some zoodles and heat everything thoroughly- even the dressing. It’s also super delicious for dipping veggies, or for making chicken skewers with veggies and dipping the chicken in the dressing. 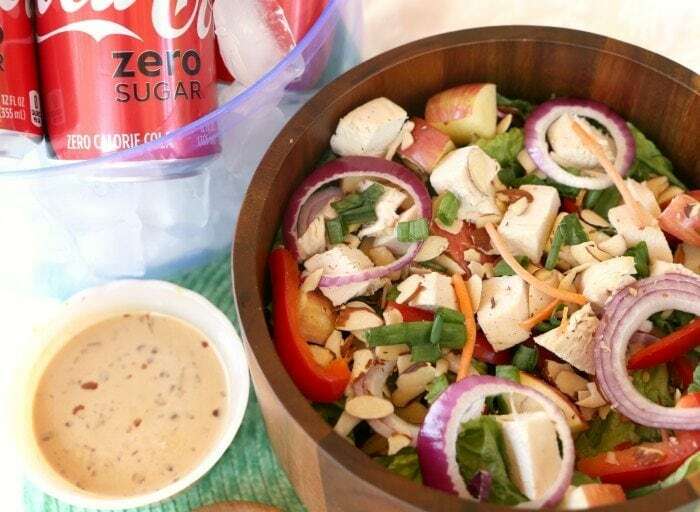 You can serve this sugar free spicy Thai peanut dressing hot or cold depending on your mood! The other day I was craving something crunchy in my diet, so I decided to make the dressing and add cabbage, carrots, and almonds- and just kept building the salad from there. Absolutely delish. 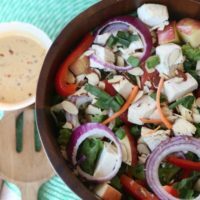 The secret ingredient to this healthy spicy Thai peanut dressing recipe- is peanut butter powder. Have you tried it yet? You mix the powder with water to create a peanut butter paste that’s packed with protein, zero sugar, and super low calorie. I have been eating it on all kinds of things- including this dressing. Add in pre-chopped veggies and rotisserie chicken from Walmart (my personal party hub since I can get recipe ingredients and cute decorations all at a low price and with one stop) and this recipe can be ready in literally 10 minutes. 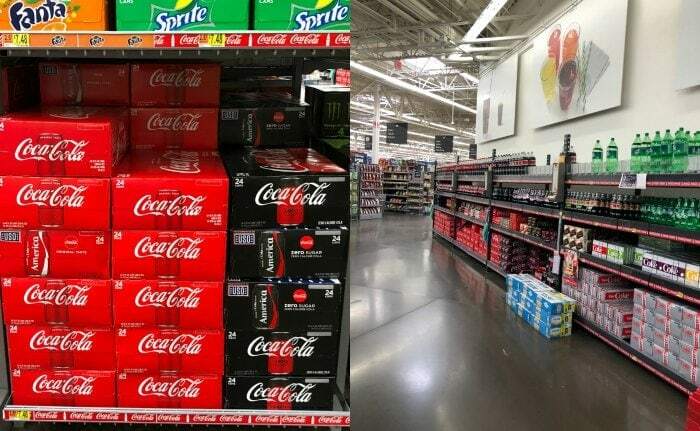 I found all my ingredients at Walmart- the Coke® Zero Sugar is in the beverage aisle and I went for the 24 pack so everyone could enjoy a cold drink (or two or three) during the big game homegate! You can find more inspiration for Fall Football Tailgating and Homegating from Coca-Cola and Walmart here. This delicious Asian inspired cabbage salad is so fresh and healthy! Cabbage, apples, green onions, romaine lettuce, carrots, slivered almonds and grilled chicken topped with the most delicious and healthy spicy Thai peanut dressing. It's the easiest healthy recipe for make ahead, dinner, or lunch on the go! Mix peanut butter powder with water, stirring until creamy. Add garlic, ginger, soy sauce, red pepper flakes and lime. Stir until well combined and set aside. Combine lettuce, cabbage, carrot, green onions, apple and almonds. 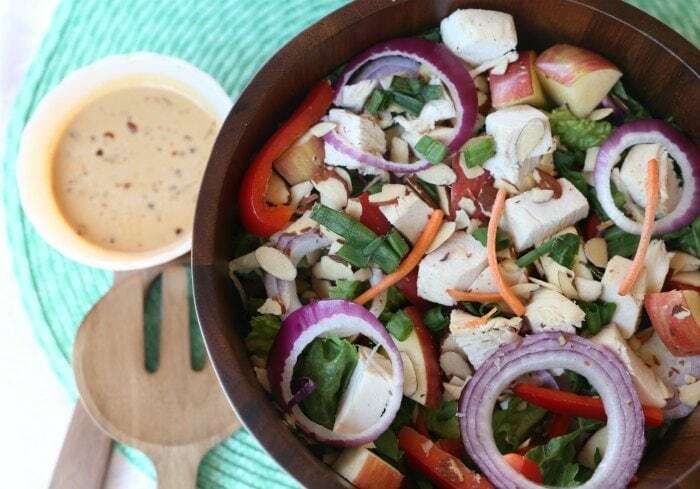 Top with chicken and drizzle with the Thai peanut dressing. Serve hot or cold! Note- I often purchase the coleslaw mix for this recipe so that I don't have to even chop the cabbage or shred the carrot. It's also a delicious salad with the prepackaged broccoli slaw.